When I was invited to attend 124 Day at Keune Academy by 124, I jumped at the chance. This is a day that connects students to opportunities, fuels them with insight into the business behind hair, and engages them in conversations on current trends. As a first timer, I had no idea what to expect. I started with the sophomores. I walked in on owner Brian Perdue educating future stylists on growing themselves and their business, “Given the choice, people will always take the better one for the cheaper price.” He continues to explain his business model, “As you get better, your number of clients will increase, allowing you to increase your price,” connecting this to his new talent salons, Genesis by 124, an interesting analogy that resonated immediately with the room. What they call an “AHA moment”. These values seemed to pop up in every conversation I had the pleasure of being a part of, like a foundation. 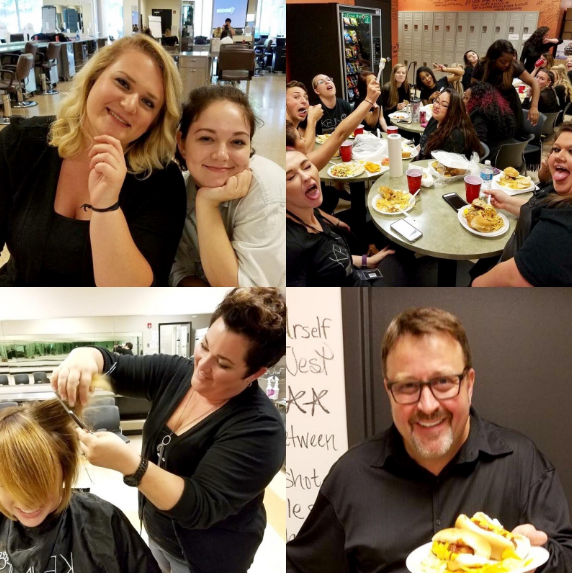 I found Salon 124 General Manager, Casey Mims, in another room coaching seniors on everything from client consultations, cutting trends, foil placement, and movement within a haircut to asking them about the first time they had an AHA moment. Throughout the day, the message remained the same, “Every salon has their own little niche and family, but at the same time their standards and values are all the same.” After a live demonstration of an undercut using a shear over comb technique, it was off to lunch. The juniors were with our guest speaker, Jay Williams. Jay has over 20 years of experience focusing on psychology and client satisfaction, or Psy-Cosmetology. He knows that a stylist always gives the best advice! Recently featured in Modern Salon Magazine, you can read all about him here: http://bit.ly/1Uxs9r5. We also got to hear from Livi and Marlo, Keune Academy by 124 alumni, working at Genesis by 124. They answered questions about the interview process and gave valuable advice on assisting through Salon 124’s Mentor Program, after graduation. Livi was drawn to Keune Academy by 124 by her dream to work for Salon 124, but both her and Marlo decided on KA because it felt like home. They’re a part of a family. 124 Day at the Keune Academy by 124 was the perfect concoction of industry influence and business building. I left feeling more inspired than ever, thinking, “That’s it, I’m going to cosmetology school!” While, for now I think I’ll stick to writing, I definitely experienced my AHA moment that day. If you’re interested in attending Keune academy by 124—Learn more about opportunities here: http://bit.ly/ApplyKA.